Last night (New Year's eve) we walked from our hotel to a curry rice fast food place nearby. Since New Year's is celebrated in Japan, there was a stage set up in the marketplace area just outside the restaurant and there were some live performances going on. While we were inside eating, we heard a pretty lively rendition of Pachelbel's Canon being played outside. It was performed with an electric violin accompanied by electric guitar, base, and drums. Curious, after finishing our dinner, we went outside to watch some of the live performance. The electric violin music was performed by a band called Aria Asia. They call their music "Street Rock Violin" - at least, that's the tag line on the brochure they handed out to the audience during their show. The woman playing the violin had a great stage presence. I liked the music so much I ended up buying the CD they were selling. You can check out a sample of their music on iTunes here. While the album I bought contains 6 songs, there are currently only two songs available on iTunes. It's very good stuff if you like the electric fiddle. I didn't take any pictures during the show, but here's a snapshot of the CD. 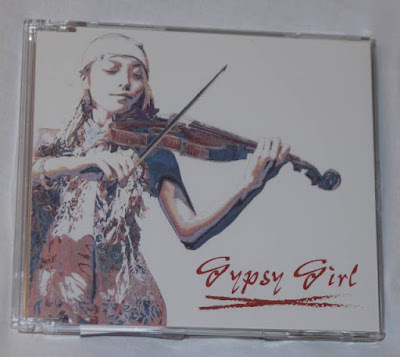 Since I bought it directly from the band, the violinist signed the CD for me and shook my hand. I think that's the first time I've ever had anyone give me their autograph.